HARRISBURG – The Pennsylvania Game Commission (PGC) honored Rep. Dan Moul (R-Adams) for his work in passage of a new law to help protect Wildlife Conservation Officers and Waterways Conservation Officers (WCOs) while on the job. Act 202 of 2014, sponsored by Moul and signed into law last fall, classifies WCOs as law enforcement officers under the Wiretapping and Electronic Surveillance Control Act. The reclassification enables WCOs to use body cameras in the performance of their duties, provided they complete required training, sanctioned by the Pennsylvania State Police, on the legal and technical aspects of wiretapping and electronic surveillance. Like other law enforcement officers, WCOs routinely encounter potentially dangerous situations on the job. Moul’s legislation was prompted by the tragic shooting death of Wildlife Conservation Officer David L. Grove of Fairfield, Adams County, in 2010. 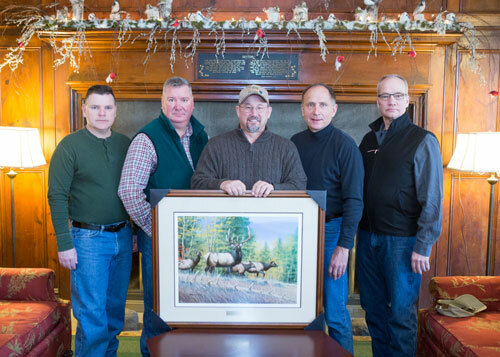 The PGC presented Moul with a framed print by Boiling Springs wildlife and nature artist Gerald W. Putt, in appreciation for his work to get this life-saving measure into law. Pictured from left are: Dan Figured, PGC northeast regional director; Rich Palmer, PGC deputy director of field operations; Moul; Rep. Keith Gillespie, chairman of the House Game and Fisheries Committee; and Matt Hough, PGC executive director.